The torch has been passed. George Lucas set fate in motion when he sold the rights of Star Wars to Disney and this was clearly one domino that was destined to fall. Beginning in 2015, all Star Wars comics will be handled by Marvel. Dark Horse, who has held the right for as long as I can recall, has one year to wrap up its runs. This includes Brian Wood's critically acclaimed story that takes place immediately after Episode IV and the newly announced Clone Wars finale that never happened. I must honestly say that I am not too happy about this, but wanted to thank the good folk at Dark Horse for all of their great work on such a beloved franchise. Not that I feel Marvel will do a bad job with the franchise, I felt that it had a good home at Dark Horse and was hoping it would continue with them. 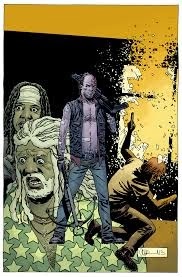 The Walking Dead #119 - When the latest arc was dubbed "All Out War" it was no joke! Robert Kirkman continues to up the ante and this is now one of the best arcs of The Walking Dead I have read in some time. This issue was packed with Ezekiel attempting to come to terms with the loss of Shiva, Rick discussing the next phase of his strategy, and the big shock, the return of Holly at the hands of Negan. This arc has been one of the most intense reads in the series that has featured some of the highest highs and lowest lows. I fear for who else will die at the hands of Negan and crew, but still have faith in Rick. If you are someone who watches the show and doesn't read the comic I would suggest hopping on at this arc. While you would be missing a ton, you would have a good clue on how vastly different the comic is from the show and how they are both good in its own light. Also, while I saw the twist before it was fully revealed, as I am sure many readers did, it was still shocking and well delivered. Bring on #120! 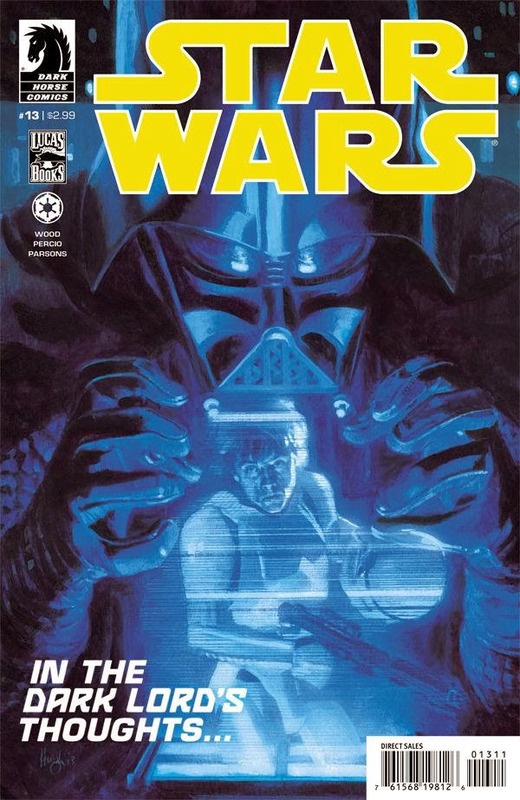 Star Wars #13 - Wood begins the first part of a Vader-centric run that sees him bent on revenge after being blamed for the destruction of the first Death Star and the embarrassment he felt after a spy was found on the Star Destroyer he commanded. Vader is portrayed through the eyes of Ensign Nanda, a newly assigned special assistant to Vader. She is horrified as she witnesses the wrath of Vader first hand as he goes against the Emperor on this secret mission. While I did enjoy this issue and think that Wood's addition to the lore should be read by every Star Wars fan, I didn't find my self horrified from what Vader was doing. One aspect that I truly loved was that Nanda justified being on the mission due to the losses she suffered from the destruction of the Death Star. It is refreshing to get a perspective other than the Rebels and it does a nice job to portray Darth and company as something more than pure evil. This would be a good jumping on point for the series if you are interested. D4VE #2 - This gem from MonkeyBrain is about your typical former defense robot who is frustrated with his marriage, his job, and his recently purchased son. D4VE takes place in a future in which the robots that were created by man have, not only killed off mankind, but eradicated every living being within our galaxy. D4VE is a former defense bot who was instrumental in that and a hero in his heyday, but currently is working a dead end job and is in a loveless marriage. He is always daydreaming and is ostracizing all of those who surround him. In issue #2, we are properly introduced to his slacker son, SC0TTY, and it appears that an alien invasion may provide the opportunity for D4VE to once again shine. Humorous writing coupled with great art make this title a must read. MonkeyBrain once again has a hit on its hands that is well worth $0.99 each issue costs. Black Widow #1 - Solid little debut from Nathan Edmondson and Phil Noto. Natasha Romanov, Black Widow, is seeking some side jobs on the side that pay cash. The catch is that she is donating the proceeds to a variety of trusts, etc. to atone for the sins of her past. In issue one we are treated to a job that has a nice little twist in terms of how she gets her target. 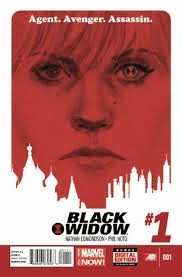 I am hoping to get some insight into her past in future issues, and it was nice to see Black Widow get her own book that provides more depth on the complex character she is. I will be back for issue #2.